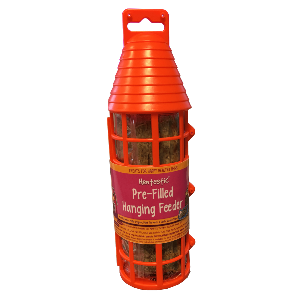 The Hentastic Pre-Filled Hanging Feeder is a great way to keep the hens entertained! This bright orange feeder comes with a mixed herb jumbo treat and it can be hung so the hens can peck it. The Jumbo Chicken Treat combines the flavours of mint, oregano, turmeric and garlic, very popular with hens. The treat also includes ridges that making pecking easier for chickens. Once treat is finished, you can reuse hanging feeder and refill with another Hentastic Jumbo Treat! (To be bought separately).